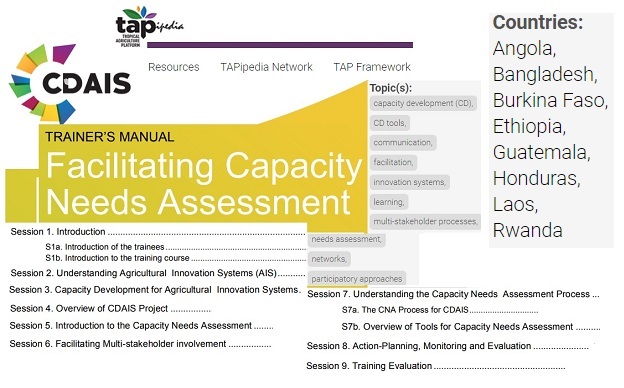 The training manual "Facilitating Capacity Needs Assessment" was published in 2017 under the EU-funded project Capacity Development for Agricultural Innovation Systems (CDAIS), a global partnership (Agrinatura, the Food and Agriculture Organization of the United Nations (FAO) and 8 pilot countries). >>> The Trainer's Manual: "Facilitating Capacity Needs Assessment" can be downloaded for free from TAPipedia (developed under CDAIS). * To be delivered by the Agrinatura Focal Persons (AFPs) and the Country Project Managers (CPMs) in each country, with the help of various other support personnel from Agrinatura and FAO. ... that provide a framework and key content for the sessions, in addition to signposts to the various resource materials required. An indication of duration is given for each session. The actual duration will depend on the facilitation required and capacities of the trainees. ... that provide step by step guidance on specific participatory activities and facilitation tools. ... that contain information for plenary presentation to NIFs during the training. ... including forms and templates for use during the training, background information, or more detail on elements in the manual. CDAIS brings together key partners and actors to address commonly identified challenges and opportunities in specific regions or within particular value chains. Together they develop and implement national capacity development plans to strengthen agricultural innovation. To provide support to national agricultural innovation systems (AIS) in eight countries in Africa (Angola, Burkina Faso, Ethiopia and Rwanda), in Asia (Bangladesh and Laos), and Central America (Guatemala and Honduras), CDAIS uses a continuous learning cycle. AIS are represented by all the individuals, organizations and enterprises that bring new products, processes and forms of organization into use, - to achieve food security, economic development and sustainable natural resource management. aims to be a global information system for good CD practices, innovation outputs, success stories and lesson learned. In particular, TAPipedia assists Tropical Agriculture Platform (TAP) members to present, explain and promote the Common Framework on CD for AIS, so that it may be more easily tested, improved, adopted and implemented by stakeholders.